The bread basket is empty.. I wonder who could the guilty party be..? When I was young, my favorite dish was Lasagna. I have an eerie feeling though it had something more to do with my love of the comic "Garfield" than it did the actual dish. 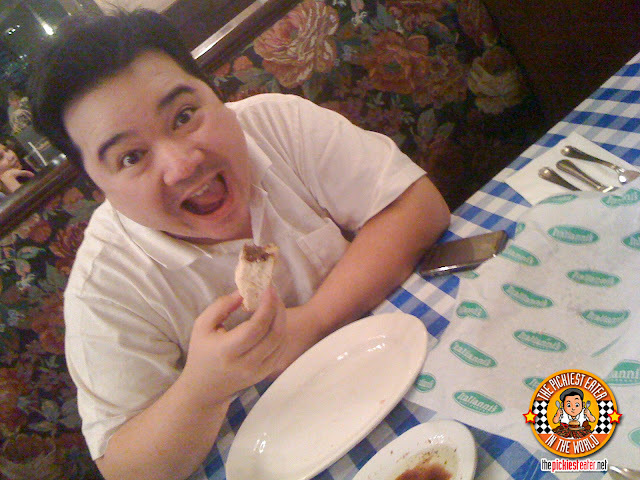 As I got older, and my acid attack became more and more frequent, I had to lessen my intake of Italian food, especially considering that tomatoes are a very prominent ingredient in the dishes I love, (Lasagna, Spaghetti, Canneloni, etc). All that gets thrown out the window when I visit Italianni's. I sit down and can't wait to get started! Their diverse menu offers a lot more than tomato based dishes, so If you're hyper acidic like me, you'll have no problems at all trying to find something to eat. 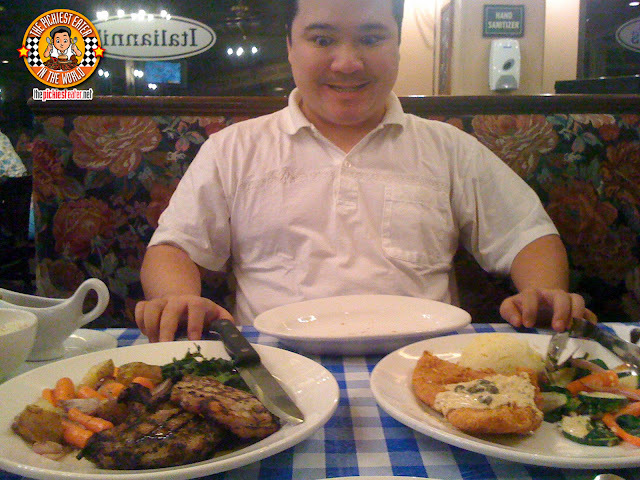 In fact with all the choices in their menu, you won't know where to begin. Italianni's bakes their own Foccacia, and it's probably one of the best types of bread you'll ever taste. They serve it complimentary, and by the basketful, making (for me) appetizers unnecessary. The Foccacia bread is served with a mixture of balsamic vinegar and olive oil. The two bottles are then left at your table so you can mix them together at your own discretion, should you eventually run out. (Believe me, you will) Anyways, I'm pretty sure you've all been to Italianni's so you know what i'm talking about. The service is impeccable as well. You are always treated like the most important person in the room, and the servers are always attentive and snap into action right away. It doesn't matter if it's the server or the manager who is hovering around - if you're a customer, you're the king of the world. The actual food isn't this anemic looking.. 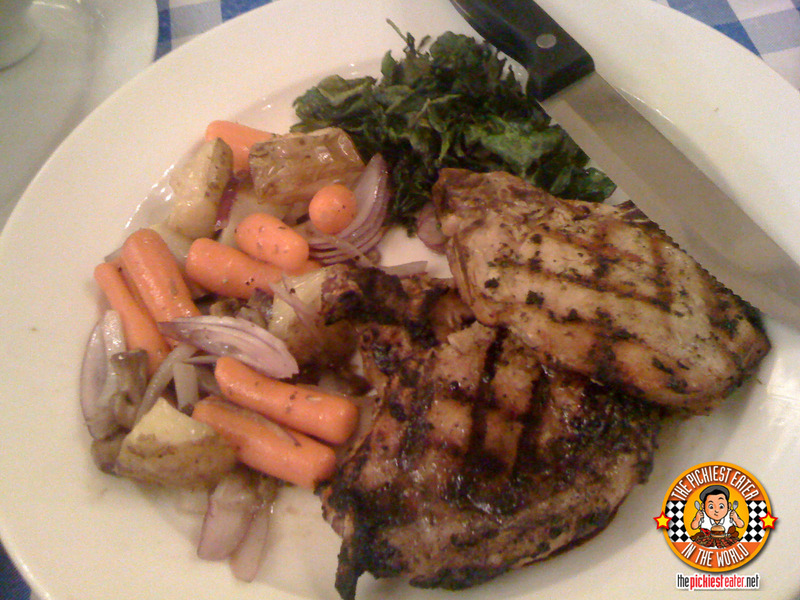 The Grilled Porkchops (P695 for 2 pcs) consists of two thick cut chops, served with seasoned veggies and fried spinach. The Chops were perfectly grilled, and even the non-fat part was still quite juicy. I do wish that they served a piece with bigger slabs of fat hehe.. but it seems to be the norm for those American franchises to serve meat with the fat sliced off, or leaner than usual. Rina, being the sweetheart that she is, gave me the part with the bigger fat. (plus I was holding a knife hehe kidding). I was surprised that I liked the fried spinach as much as I did. I mixed it in with the Mashed Potatoes from my other order and it came out really good. 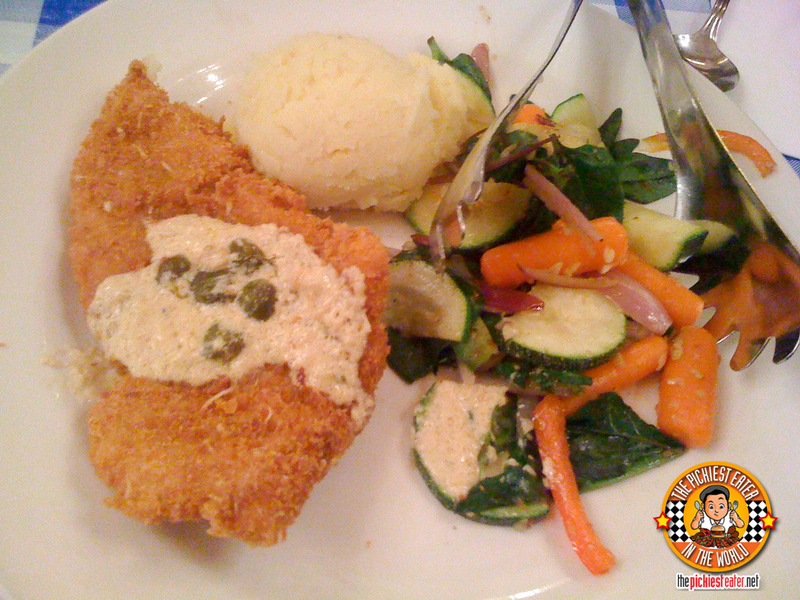 Our other order was the Parmesan Crusted Fish Fillet (P395). It had a nice crunch to it with every bite I took, and the fish itself was really tasty. I'm not too found of capers, but this "caper cream sauce" had a richness to it that didn't taste "caper-y" at all. I didn't really care for the side order of veggies, but I did like the mashed potatoes as earlier mentioned. The only thing they could've improved was adding more of the cream sauce. I wouldn't have minded totally drowning the whole thing in the sauce, but for those who don't share my appetite for rich sauces, they should have had some extra on the side, to add when needed. This is me going crazy.. I honestly Don't know where to start.. The only drawback of Italianni's is the price. It really is quite expensive (for me that is) They do have "Cheap" lunch meals that hover around the P350 range (In what world is P350 considered 'cheap for lunch'?) But if you do have the cash to spend, it definitely won't be wasted here. That's why I try to earn back everything I spent on the bread alone hehe..Though it's not as extravagant as most steakhouses around, it's still not something you could go to on a weekly basis. Getting a "Bistro Frequent Foodie Card" would be a wise move too, especially if you're like me and enjoy the food of Italianni's, Fish and Co, Flap Jacks and Fridays. At P1,500 (consumable) you get a discount card that allows you to get 20% off everytime you dine in one of the mentioned restaurants. My only bone that I have to pick with the said Bistro Card is that they never mailed me the actual card, despite my numerous reminders to do so. In effect, I had a crumpled up piece of cardboard in my wallet for the past year. Don't worry about the P1,500 price tab for the card, because when you buy it, it comes with a P1,500.00 Gift certificate - which you'll end up spending anyway if you go to any of those restaurants. So it more or less comes out looking like the card is free.